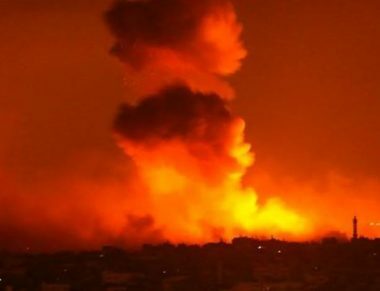 The Israeli Air Force fired, on Tuesday at dawn, three missiles into a site, run by the Al-Qassam Brigades, the armed wing of Hamas, northwest of Khan Younis, in the southern part of the Gaza Strip, causing property damage. Palestinian sources said the missiles caused property damage to the site, and nearby structures, but did not lead to any casualties. The Israeli army said it was ” to a homemade shell,” reportedly fired from Khan Younis, and landed in an open area in the Eshkol Regional Council of Settlements. The army held Hamas responsible for the shell, and for any escalation in the region.